Trevor Bench-Capon is well recognised as an outstanding figure in Artificial Intelligence and Law, having published extensively over the long course of his career on legal knowledge representation, engineering methods for knowledge-based systems, theoretical and applied argumentation, case-based reasoning, policy-making, reasoning about evidence, and many other related topics. he has deeply influenced many of his colleagues, particularly with his earlier work on principled methods for legal knowledge-based systems, and later with the introduction of values in the study of argumentation. 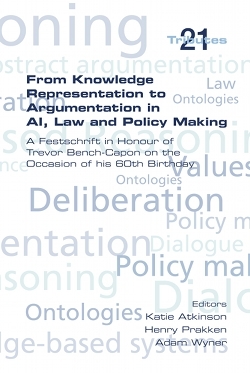 This Festschrift is in honour of Bench-Capon's work and its seminal influence. The articles contained here by his colleagues extensively review comment on, and extend Bench-Capon's work. As a whole the volume is a substantive introduction to the main topics and issues to which Bench-Capon has contributed so much.